Weekly Science Quiz: Did Einstein Really Say That? It is very popular, nowadays, to strengthen an argument by quoting Einstein. The problem is that many of the quotes attributed to Einstein were never actually his. Some were him repeating a quote of another individual, but many others seem to be completely made up. Einstein has become the source to a treasure trove of phony quotes, largely because the internet has enabled us to share so much without sourcing anything. Einstein did not humiliate an atheist professor as an undergraduate, but Google returns over 61,000 hits on the subject. Nor did he trade places with his chauffeur and let the driver give his lecture instead. Recently, Einstein has been resurrected to say that if all the bees disappeared mankind would be extinct in four years. A classic case of a quote being invented and attributed to someone famous to give it extra credence. Einstein has been used by both sides of the debate on religion. 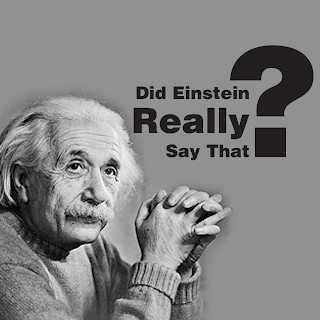 So, how well do YOU know what Einstein said? Take our quiz and find out—you might be surprised.